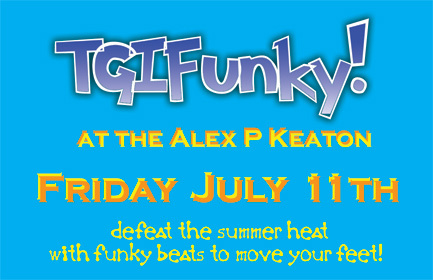 Welcome to www.TGIFunky.com: TGIFunky! returns with a night of dancefloor favourites! TGIFunky! returns with a night of dancefloor favourites! comes to the APK to play an exclusive throwback set with the classic funky jackin' and Chicago house that you know and love (and miss) from the Lush days, with a bit of new flava thrown in to keep you on your toes! resident Skank Honto will be warming the night up with a mix of funky breaks of all tempos and sounds, but in the words of James Brown, "whatever I play, it's got to be funky!" TGIFunky! returns on Friday the 13th!